We are an FAA Certified repair station specializing in Avionics installation and repair, Pitot-Static/Transponder Certifications, Dynamic Propeller balancing, and Aircraft Maintenance. I've been a pilot for 36 years, an FAA certified Airframe & Powerplant mechanic for more than 31 years, I hold an FAA Inspection Authorization (IA), FAA Repairman certificate and FCC General Radio Operators License (GROL). Graduating from Embry Riddle Aeronautical University back in 1981 I majored in Avionics/Electronics in addition to the A&P maintenance program and received my A&P along with a FCC General Radio Operator license. While attending school I helped operate the schools certified avionics repair station doing line and avionics bench repair work on the Universities fleet of single and twin engine aircraft (helped pay for tuition) as I already had previous electronics and aviation experience. Prior to attending Embry Riddle I worked in GA as an apprentice mechanic, then after finishing school I returned to GA for a couple years as a mechanic, avionics bench tech and avionics installer before joining the airlines as an avionics technician. During my 25 year stint at the airlines I worked as a avionics tech (bench & line), mechanic, inspector (avionics & airframe), avionics engineer, maintenance supervisor, quality supervisor and maintenance manager. I retired from the airlines then did a couple more years in aircraft manufacturing supervising the assembly of the Sikorski UH-60 'BlackHawk', Boeing C17, and Gulfstream GV structures. The planets finally aligned in 2000 and I was able to pursue my life long dream of building my own aircraft. After looking at all the different models available I chose Van's due to their performance, solid design, proven history, great reputation, and all metal design which I had years of experience with. 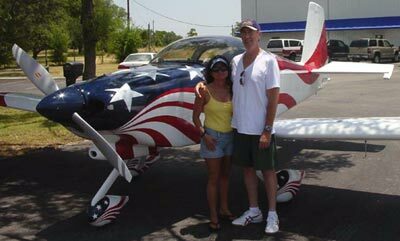 I completed a standard "slow build" RV7A aircraft in late 2004 after 4 years of diligent work. Along the way I made lots of friends in the 'RV' community and found myself assisting other builders with their projects as well. Most builders didn't have experience (no aircraft experience in many cases) with structures, riveting, general wiring practices, avionics installations, standard aircraft practice etc. that I did. So I started Exp Aircraft Services LLC because I love working on airplanes, and I saw a real need in the Experimental aviation community for an experienced aviation maintenance professional. Someone who can help get you started, show you some basic processes, keep you motivated and generally help you build a safe, reliable aircraft that you and your family can enjoy. I have very high standards and expectations of quality. I let my customers know from the get go that if something needs to be fixed they need to be on board with the repair. In fact, part of the condition when I accept an aircraft in for an annual or conditional inspection is that there will be very little negotiation on airworthiness items that need repair. That means from nose to tail, on every airplane, if a repair is needed it will get fixed. The quality of my service and keeping my customers safe is my number one goal and I refuse to compromise these standards. When an airplane leaves my shop, I would fly my family in it. To me nothing is more important than SAFETY, so I offer free safety inspections to local aircraft builders under the EAA Technical Counselor program. This service is totally free of charge and I encourage all builders to have a second set of eyes look at their experimental aircraft project both during construction and prior to that critical first flight! The best part is it costs you nothing! Many shops that work on certified aircraft shy away or even refuse to work on Experimental aircraft and the shops that will work on them often do not know the regulations for experimental aircraft or have any experience working on them. It pays to bring your experimental aircraft to an expert, this is what we specialize in! Please feel free to email or call me with questions or to arrange a meeting.